Personalized Gift for Him? Customize this Best Bear Bunch for your gift need: Choose your favorite teddy bears up to 7 and place your teddies onto couch in the way you like. Give a gift message and all of the first names for handwritten personalizing, free of charge. Add the impressive accessories for extra personal touch. Best Bear Bunch, Customized Gifts Personalized Free! 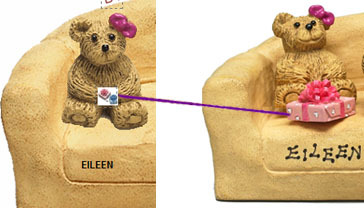 Choose your favorite teddy bears up to 7 and place your teddies onto couch in the way you like. 8 X 4" over 4 lbs. For up to 7 bears and 7 accessories. 5 X 3" for 2 lbs, Laying bear has a flat bottom wearing a jersey in white, red or blue. 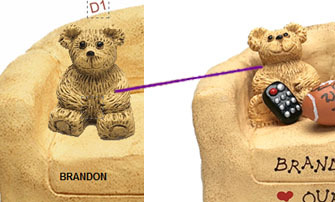 It's designed to represent a "lazy" person, ready for you to personalize with a free name/saying on the jersey or/and customize with other bears on a plaque or a couch. Click Spot A on the chair and view the bears offered.